If there's one thing we can learn from its 3DS catalogue so far, it's that Nintendo is great at the safe sequel. Sure, there are out-there exceptions like Kid Icarus: Uprising, but by and large we've seen a whole lot of remakes or new entries in fan-favourite franchises that are more interested in paddling along leisurely than rocking the boat. Great games can and have followed this strategy, of course, but not without a little yearning for something more — and Paper Mario: Sticker Star feels content with offering largely more of the same. Luckily for Sticker Star, "more of the same" is a charming formula certain to please the masses with its amazingly slick presentation, polished mechanics and sharp wit that made the series so endearing in the first place. The problem is that it all feels incredibly familiar, largely lacking new and interesting characters or environments that haven't been done to death by now, and what is new doesn't quite reach its full potential. Sticker Star's premise is paper thin, serving mostly as a dull framework for all manner of other shenanigans throughout the game. During the annual Sticker Fest held in Decalburg — a city of Toads, apparently — in which the Sticker Comet comes along to grant everyone wishes, Bowser comes along and blows things up by accident, scattering powerful Royal Stickers all across the world that Mario and his new ally Kersti must venture out and collect, plonk Bowser and all that jazz. Along the way you'll run up against Kamek, Bowser Jr., familiar rogues and lots of Toads, but new faces are few and far between; companion Kersti pops up with a tap of L to offer a quip and advice, but she never feels fleshed out and as a result is difficult to care for. The supporting cast is mostly made up of Toads, with virtually no sign of anyone more interesting, which is disappointing for a series that has otherwise proven itself quite fresh. 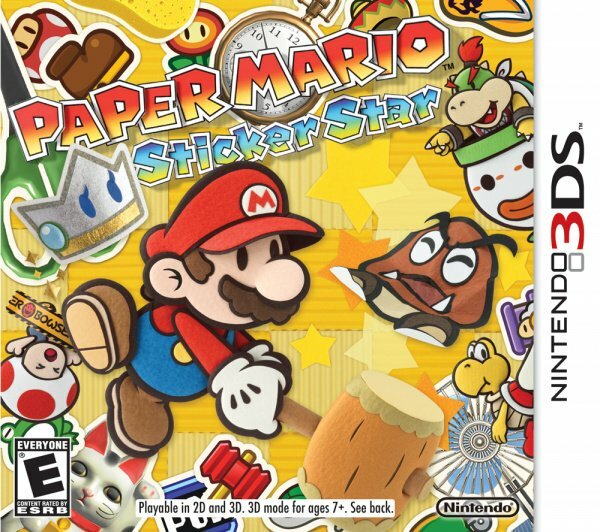 Star of the show, of course, are stickers, a seemingly organic addition to Paper Mario: they are littered all over the place and used for virtually everything from puzzles to pugilism. The series' turn-based combat makes a welcome return from its quick absence in Super Paper Mario and revolves entirely around seals: instead of having a few standard and special attacks that require a meter, Mario's attacks are dictated by what is on-hand in his sticker book. There is no shortage as stickers are readily available all over the place, gathered by pulling them off walls, in boxes and dropped by enemies; however, as certain stickers are more effective against specific types of enemies, along with a limited inventory and varying sizes, there is a certain layer of strategy to making efficient use of Mario's arsenal — especially when facing eclectic bands of foes. By default only one sticker can be applied per turn, but taking a whirl on the Battle Spinner for a price can enable up to three, allowing Mario to chain combos. Stickers cannot be otherwise combined or crafted to form new abilities, which feels like a missed opportunity for an otherwise clever attack system. This turn-based combat is a streamlined holdover from the series' RPG roots, and Sticker Star further smooths out the levelling from prior games. At this point the RPG elements are entirely invisible; not once will "level up!" splash across the screen, nor can you find a status screen showing Mario's experience points because there just aren't any. Mario does grow in strength, though, but it isn't noticeable outside of damage done when bopping an enemy, which might go unnoticed anyway. 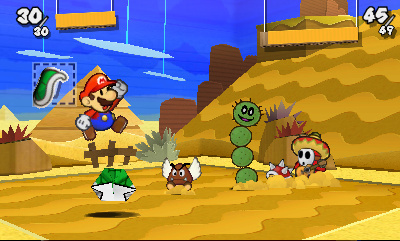 Mario can collect certain non-paper items and transform them into special stickers, like a pair of scissors or a Lucky Cat statue, and these stickers can be used in battle or applied to the game world through Paperization, a power Kersti has where she lifts Mario out of the world, flattens it like a postcard and dangles him above. This is the most interesting idea Sticker Star drums up, elegant in its simplicity and execution, but gets stuck on limitation: Mario can apply stickers, remove scraps of paper that affect the environment and put them back on to fill voids, but he can't apply stickers to just anything nor tear off scraps that aren't predetermined. Had Mario the power to manipulate the environment in more ways, then puzzles wouldn't perhaps rely so much on using the correct item that you may or may not have arbitrarily found and created a sticker from, or by applying the correct scrap through Paperization. The world is a diverse and interesting place, but Sticker Star has a bad habit of leaning too heavily on obtuse, same-y types of puzzles and scenarios for stages, resulting in a few more soggy portions than needed. As this is the first portable Paper Mario, the game has been adapted into handheld-friendly stages spanning a fairly large world — and, rather pleasingly, the world map is somewhat nonlinear, allowing you to tackle areas in whatever order you see fit. Collecting the star at the end of a stage opens up a new path on the map, with plenty of hidden exits and items sprinkled about to encourage exploration. "Encourage" may be putting it lightly, though, as hidden items are occasionally critical to advancing, and it isn't always clear where specific items are located — it's a somewhat obtuse way of progressing, but taking the time to explore thoroughly eases the pain down the line. While, yes, you can enter whatever available stage you choose, the experience is still somewhat linear as you may not have the required items to proceed, but allowing this freedom goes a long way towards reducing the sense of the whole thing being on rails. 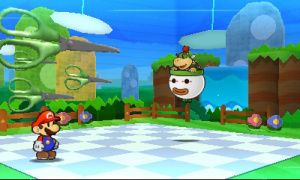 It must be said that one area where Sticker Star absolutely shines is visually: the game is gorgeous in 3D, bringing the papercraft world to new heights as a living diorama. The excellent art style, already whimsical, just looks fantastic with the added depth, and much like Super Mario 3D Land is greatly enhanced by stereoscopic visuals, standing as one of the best uses of the technology so far — it doesn't change how the game plays, but the enhancement is so great that going back feels cheap and flat. Along with the sharp and clever writing, Sticker Star is without doubt one of the most charming games you can get on the platform. Paper Mario: Sticker Star is often funny, thoroughly charming and a joy to play, but it is also just as often a touch too familiar, seemingly unwilling to really go out on a limb and do something crazy even if the potential to do so is immense. Despite its inhibitions, the game keeps a pace so delightful and fun that you can't help but crack a smile at the metric ton of whimsy folded into its rock-solid foundation, rendered all the more impressive thanks to beautiful use of stereoscopic 3D. Sticker Star might elicit some déjà vu, but a memory this bright is one worth remembering. Was expecting an 9 on this one, but good review anyway. Looking forward to buy this one! So it got one less star for being not much different? I was sure it would at least get a 9! But I'm still getting it for Christmas! I've found with the Paper Mario games that they may be familiar but they are a bit out there and different. I guess I need to wait to play it. Bit of a shock, I was expecting a 9. I'll still be picking it up, none the less. Hm... ok. I was expecting a higher score I guess. Nice review though! Preordered. Score wouldn't make a difference. 8/10 Not bad I may pick this up for Christmas, @JonWahlgren great review man. I want it. Can't wait for the digital download! I have a bad feeling I'm not going to like this game. After Super Paper Mario the fact this one seems to be more of the same old is actually quite a relief to me at least. If this is anything like the Gamecube game, then it will be a joy to play on the 3DS. Nice review, although I'm a tad worried about how it's mostly getting eight out of ten reviews. I don't feel surprised it got an 8. I've been feeling this game as an 8/10 for a while now. There are a few things that make me feel this will be less enjoyable than the first two paper marios. It's mainly the lack of partners and the more platformer/level based style that is putting me off. Not just that but it seems like the only friendly npcs we've seen so far have been Toads....where's the variety gone? I'm more excited for the other brothers outing, Luigi's Mansion: Dark Dawn. I'm a little dissapointed that they simply decided to play it safely and reuse everything instead of presenting several new characters, enemies and places like the previous games. I'm also not fond of the idea of using stickers and that stuff. Is the main story long ? Really disappointed that they removed the RPG elements...Is there any point in battling at all? Or would it be more beneficial to just dodge every fight you can? I'm not sure I will like this. But I'll probably buy it anyway. Seriously, 8/10 = great, as far as I'm concerned. All the screenshots suggested an 8 to me. I was hoping they were holding back some surprises that might have bumped up the score but it seems they reveal pretty much what's in this game. the visuals and the cant go wrong play mechanics are enough for me to download it and get the donkey kong offer. 8 is a great score, but I was hoping for a 9. I'll probably get it though. I've never played a Paper Mario game so I won't feel any familiarity. I can't wait to see how the 3D looks! Cool, can't wait to get this. I hacen't played a Paper Mario game in a while. Well, that's certainly a lot higher than the 2/5 GameXplain gave it. Seems most other reviewers seem to rather like it thusfar. I've personally been enthralled by everything I've seen of it thusfar, and by the little bit of time I got playing it at an event, so I'll be sure to buy it. Geez, since when was 8 a bad score? Too true. People have way too inflated expectations for everything nowadays. So the only real complaint is its familiarity? That's great, as I've never even played a Paper Mario game before! It's not that I didn't want to, it's just that I've never had the chance. I'm going to thoroughly enjoy this. Guys, this did as good as Thousand Year Door did. So basically, expect this to be as good as Paper Mario TTYD. @MultiMariosonic I don't think anything in the series can match TTYD That's one of my favorite games, in the top 3 of mine, easy. No doubt it'll be great, though. 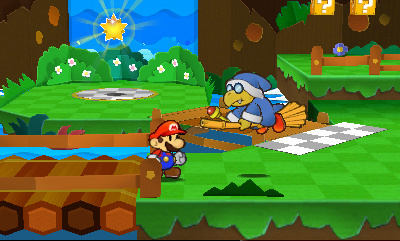 Ever since Sticker Star was unveiled I've had the feeling it was never going to match up to the rest of the series, and the lack of any interesting companions or NPC's worries me a little, as that's one of the major reasons that the Paper Mario series is one of my favourite. I may hold off buying this for a while, even if it did score an 8. I wasn't expecting this to be the greatest Paper Mario game, nothing will top TTYD. Negatives are similarities to the originals. What if you have never played any of them =D i.e. me! ? @GazPlant 15 - I'm also with you on that one! The Thousand Year Door was awesome, please make a true sequel to that game without removing the partners and the level-up system! Still looking forward to it but it´s a shame that these features has been left out! @Reala 17 - Yeah, that's true! I'm still excited. I have a preorder down. I wish there was a bit more darkness to the story like other Paper Mario games (it kept things from getting so silly that it was too much). Doesn't sound like they learned from SPM (one of my least favorite things about a game I already didn't like, the partners were incredibly boring, all looked the same (like a bundle of random shapes) and were barely used). It looks a lot better then SPM, but I doubt it will beat the 64 game for me. I still need to get TTYD sometime. Still, most of the complaints in this review felt like they would prefer living in the New Super Mario Bros. 2 review. @craig0rneil3 If it is like Paper Mario 64 and TTYD then it will still be a fun experience. Both games are very different from anything else. You walk around a 2.5d world where everything looks like it is made of paper and crafting materials. The battle system revolves around action commands. Do something at the right time and the attack is more powerful. Not much different? I think this is pretty different comparing the other games in the series! @TeeJay No, it has some real arbitrary and obtuse puzzle design, which is far more of a blight. @3Dash Ah--That would make sense. Well, I was planning on getting it regardless anyhow. It amuses me that everyone has been annoyed at the changes so you say it's too similar. Decent chance I'd agree, just an odd thing I noticed. I think I'll pass on this game. Sounds good, but, how many times do they say "sticky situation?" If it ain't broke, don't fix it. Still preordered, looking forward to the upcoming weekend. No partners besides kersti ? Pre-ordered it already, since PM is my favorite game serie. Looking forward to it's EU release! I'm so happy they ditched the terrible SPM system. Entering the diorama contest and hoping to get a free copy of this. Seems like a good enough score for me. I'm looking forward to getting this come Christmas. Am I the only person on the planet who liked Super Paper Mario? Sure, it didn't feel like a PM game, but it was still a solid platformer. I liked SPM...One of the main things I enjoy in Paper Mario games in general is the story anyways, and Super Paper Mario had a good one. I'm worried this will be another Super Paper Mario, but I've been looking forward to it for too long to not get it now. And interesting too — a perfect example of why people need to not just look at the score, but read the review. The review itself reads like it would recieve a much lower score. Quite frankly, this is exactly what i wanted to read in a review — you hit on all the questions i had personally about the game, and while i'm sure it is a great, fun game, your review confimed all my concerns over the game and reinforced my decision not to pick it up. Seems like they put heavy emphasis on making it a portable game in a more pick-up and play kind of way. Also sounds like there's more exploration than in the previous games. Might still pick it up but now i don't really feel the rush to get it asap anymore. It's also a bit of a shame this will probably be the only sticker game in the series. I would have loved to see the concept living up to all of its potential in a future game maybe. Gonna try out the download service on this, can't wait for this weekend when its out. @craig0rneil3 The first two are in my top three games of all time, and I wasn't previously crazy about RPGs. I expect this one will live up, but you certainly couldn't go wrong trying the first on VC. Nice review and nice score! I didn't get the feeling that it is a "thousand year door" beater (and I didn't expect it anyway), but I still think it will be lots of fun! I'll definitely buy it! Oh, Bowser Junior is back. Didn't expect that. I didn't like Super Paper Mario because it tried to combine Super Mario and Paper Mario but both parts were average. It was an average Paper Mario game and an average Super Mario platformer. I'm really happy to see it go back to a more classic Paper Mario style. What CrispyGoomba said. It seems like it will be a lot better than Super Paper Mario, although it sounds like this won't be as good as Paper Mario 1 and TTYD...which is disappointing to be honest. Thanks for being so honest, Jon. I still want it, but my expectations are lowered. I have a bad feeling I'm not going to like this game. I loved the darkness and atmosphere of Paper Mario 2, The leveling system and badges were the elements that brought me back year after year to replay it. It looks like this game has degenerated back to another sub-par RPG. If you lose me on this, Nintendo, I don't know what I'll do. This only the third proper Paper Mario RPG, so I'm sure it being familiar isn't really so much of a bad thing. Yay! I'm glad we got a review already. I'm downloading this. Aww man, only an 8? Well that goes to show how high my expectations were. Gonna buy it no matter what. How could Super Paper Mario get a higher score than this? @NintenDude97 - 1) 8/10 is far from a poor score. 2) Two people different people reviewed Super Paper Mario and Sticker Star. Hey guys, Would you recommend this game to me? (I've never had a paper mario game) I like games like smb3, advance wars, and mario & luigi: bowsers inside story. Paper Mario and Mario & Luigi are by no means the same, but they are similar series. I would recommend you start with Paper Mario and the Thousand Year Door or even Super Paper Mario, and they're both great games (imo of course), but it's safe to say that if you like your Mario with story, characters, and RPG-lite elements, this isn't a bad choice. @gamermii - I can't specifically recommend this game (since I've yet to play it), but generally speaking, it's a pretty safe bet that if you like the Mario & Luigi games, you'll probably like the Paper Mario games too. Thanks guys!! I'll be sure to try out super paper mario and I'll download this game/go & get it the old fashioned way. Have to hold off on this. Need MARIO KART 7, CODE OF PRINCESS, & MONSTER HUNTER 3/4 first. Honestly if they made Thousand Year Door in 3D on the 3DS I'd buy it again. Even if they made Vivian female again when she's transgender in Japanese. I don't know why Nintendo is trying to take the RPG out of Paper Mario. I enjoyed Super Paper Mario for its blend of Action-RPG and platforming elements. With Sticker Star, they seem to hide all the RPG elements that people have enjoyed with the prior games. It might be in part to lack of detail in the review. There is no mention of HP increase or less damage taken throughout the game. My biggest gripe with the game is the removal of basic attack commands from the game. While it is something different, I find it annoying. They did away with XP, but you have to grind for stickers in order to actually do anything. Giving up on evil to embrace another in my opinion. I enjoyed Super Pape Mario, heck' it's one of my favorite Wii games. But I dread the thought of putting up with Turn Based Combat in Sticker Star. I'll still most likley be picking this up....Eventually.The big push would be experiencing this in Stereoscopic 3D, otherwise i don't think I'd bother. In the Kettle it goes! Bbbut I thought we agreed on everything! Super Paper Mario is still awesome though, in a different way. Anyone who says it isn't is probably wrong. 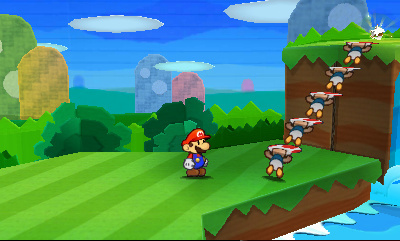 This honestly looks like Super Mario 3D Land for Paper Mario in terms of reusing the series' ideas and having no story or anything actually new. Except for the stickers of course, which look to be more annoying than anything. It seems kinda suspicious to me that this and twilight princess both got 8's for being too familiar and not trying anything new while "new" super mario bros 2 got a 9 even though it did absolutely nothing new. I know for a fact that twilight princess is far better than nsmb2 and sticker star looks like it is too. @Kid_A Correct. Terrible backtracking is terrible. I'll pass on this one. I was not looking forward to this game anyways. Im thinking of getting the Digital version, but i have to get a new sd card. Alone? I always wanted a direct sequel for that! I really liked the style and the partner characters. Easily the best Paper Mario. I don't mind a bit of familiarity when the series is as good as this. I suppose they might have been stung by the criticism of the Wii version, as it was quite different to the other Paper Mario games. I enjoyed the Wii version, but am enjoying the N64 one more (so far - rescued 4 star spirits), which i'm currently playing on Wii VC. Not played thousnd year door, but would like to some day. I do love how people act like an 8/10 is a terrible score that means the game isn't worth playing. I know 8 isn't a terrible score,it's a great score,but I'm just so surprise that this didn't get a 9. Any hoo,I'll be asking for this for Christmas,as this'll be my first Paper Mario game. If the Wii U wasn't right around the corner I'd get this for sure....but this month has already been too expensive. What went wrong with the paper mario series . Paper Mario (N64) : A good solid rpg. Thousand year door: An even better rpg that improved on EVERYTHING the n64 game did, with one of the most diverse character populations and areas in any game (at the time). Great review I will be picking this up for sure. "I hope you like toads"
GamexPlain gave it a frickin' 2 out of 5. I would rather agree with this 8 out of 10; the game looks awesome. @shinpichu You most certainly are not. I have played Super Paper Mario I liked it a lot. It had a unique feel to it and the gameplay was fun. Though I would have to say that TTYD is my favorite of the series. It doesn't sound like it will be as good as the previous 3 games in the series with its simple story and samey environments and characters and no partners except from Kersti. I'm also not too keen on the sticker system. @Shinpichu I love Super paper Mario,its an excellent game and its my 9th favourite Wii game! Haven't played mario rpg since I was 3 (N64), still not sure if I should get this. 1. How similar is this game to the original Paper Mario on N64? 2. What is the overall difficulty of this game from start to finish? Is it a pain in the neck to finish because it's hard, or is it a breeze that happens painlessly and quickly? @shinpichu I agree, I have no idea why people are complaining about a great score. One thing I want to point out though, is that the last Paper Mario game wasn't the same as this Paper Mario, so I think that should somewhat diminish the whole "it's the same Paper Mario" argument when you consider Thousand Year Door was released on the Gamecube back around 2004-2006. Also, people need to stop saying the RPG elements are removed. They're still there. "Sticker Star's premise is paper thin"
"the enhancement is so great that going back feels cheap and flat"
You just couldn't resist all those puns, could you? Several of the RPG elements I liked ARE removed. Right of the top of my head. No badges,(so no FP moves, and no Star power equivalents either), simplified attack timing system (you can still time attacks, but there don't seem to be advanced "Superb" commands like in the previous two games), no leveling, no partners (and so no partner upgrading either). And I'm sure there is more. Would it still feel "familiar" if it's my first paper mario? What happened to when games were interesting and fun by our own thoughts and feelings rather than review score? How long (hours to complete) is this game? Hm. The score is a bit low but I may get it. After all,I have been ITCHING to play it. May want this since I've havent played a PaperMario yet. Yeah, the familiarity complaint is silly. So much has changed with the sticker mechanic and the rpg elements changes, that the game feels fairly different from the first two Paper Marios. I'm enjoying the heck out of how much more "papery" the game is and trying to keep a good balance of stickers. I'd give this around an 8.5 at the very least. If this game is familiar, then the reviewer probably finds Paper Mario 2 to be the exact same game as Paper Mario 1. An 8/10 is still a good score in my opinion. And yes..I agree with everyone who loved Thousand Year Old Door.. I still have my copy for my GC and played through it 3 times. I will eventually pick this up. Super Paper Mario was my favourite (played n64, GC, Wii and some of SNES, if that counts). I'm less excited for this now, and might wait until I find it super cheap. Played this a bit at EB Expo and I just get the feeling I'm going to find the sticker collecting and dialogue streams too tedious. Yes, but people behave as if the RPG mechanics are removed entirely. The badges were removed because the Stickers defeat their purpose. Other RPG mechanics such as turn based battles, HP, etc. are still there. The FP is rendered moot for the same reasons the Badges are. Stickers defeat their purpose. Rather than attacks using FP, they use a sticker. Again, it's the same reason Partners were removed. Stickers take their place. There's no reason to complain when you can still do most of the moves (such as kicking a Koopa Shell much in the way you did in Paper Mario with Kooper) that you could do before, with some added improvements here and there. Nearly everything that people are whining about being "missing" is still in the game in some form or another. Even the Tattle function is still partially intact. The EXP system is one of the "RPG" elements removed from the game. I'll probably get this eventually. I'd much rather see a Mario and Luigi RPG 4, though... that series is GOLD. This is funny because another review I read on a game site was emphasizing how DIFFERENT it was. I honestly can't believe the ammount of people saying 8 is a bad score. It's as if because they want to buy it, it must have a 9 or they get insecure. Because if it recieves 10, it's ludicrous and compared to everything. Please pay more attention to the writing and use that to gauge your mileage. This game is great by any scale. This is a VERY hard game. What's the point in battling? It doesn't give you anything. This and boring backtracking means I ain't getting it. Please Luigi's Mansion 2, don"t fail me! I love Paper Mario, but if you think this game is going to be anything like The Thousand Year Door, then please think again. I'm not saying sticker star is a bad game at all, but it is very different from the previous two Paper Mario's. The game is basically levels you go through to get a piece of a star. You don't roam around like the previous two......you always know where your going because of the level system. So I fully agree with an 8/10 as the score for this game, and I wish Nintendo had done more with this game but it's a good start. I fully agree, I would love to see a Mario and Luigi RPG 4 for the 3DS!!! I've always been less sure I'd want this one. The partners were a huge part of the game for me in the other ones, and while I think I might enjoy this one, I don't think it's worth $40 to me. Paper Mario is the kind of game that NEEDS to stay the same. I did enjoy Super Paper Mario, don't get me wrong, but it loses the formula that made it endearing in previous titles. It felt too locked-in for myself. The classic Mario Bro. 's Platforming doesn't feel that way to me because you don't need to focus on the story, per say, since you are technically following a predetermined path and exploring the crap out of it. When you make it necessary to follow a set path and follow a story, it feels less engaging. When a game is made 3D it becomes "open to interpretation," since the only constant is the story, which isn't forced onto the player (although, players are rewarded for following it with new environments and enemies, weapons and mini-games). It feels less engaging due to the forced story. It's not the gamer's option to follow the story doggedly and can therefore turn away exploration-oriented and certain casual gamers (like some of the Animal Crossing crowd, for example). Going to get this in the EU release date. I hope this is as good as the review says! I'm a fan of the first two paper marios and I was pretty disappointed with the changes made with this one, but now that I've played it for 14 hours I realized I was terribly wrong. Trust me, this paper Mario is GREAT and many things I've read from reviews are absolutely not true imho (backtracking, battles are pointless, stickers don't work, etc.) If you don't fight, you don't get coins and you will need them in many occasions. I explored every level accurately and I never needed to do any backtracking so far. The game also gave useful hints for the most complex puzzles. Stickers are fun and will make the absence of partners much less painful. Did I mention that the soundtrack is amazing? The only thing I didn't like is the lack of new characters.... Miyamoto.. why? Can't wait to download this Christmas day. On a new 3DS XL, no less! What if they had added a multiplayer option? For some reason I like the other versions of mario better. Don't really know why I can't get into this one. The backtracking and essential need for very well hidden items from earlier levels make this game too much of a slog. It's a damn shame because when it flows it's great - but life's too short for games that require you to keep a constant eye on a walkthrough. Loved all the others - really disappointed by this. No experience and leveling up... I am disappointed. I can't help but feel that this game is incredibly underrated. I mean, yeah, some story and dynamic characters would have been nice, but does experience and leveling up really add anything to the game? Not to me it doesn't. If anything, it makes it so that you don't have to grind any. I think this game is wonderfully fun and super charming. I think this game is very bad. ... It's definitely not worthy of being compared to the past three games. Also - sorry if I was kinda self advertising there. Easily the worst Paper Mario game AND it's a bad game on its own merits! Stay away. That is super nice stuff and you know it. It was a terrible, travesty of a game that was rushed through production to have a major 3DS title for Christmas 2012. They brought back turn-based battles and made them redundant because you gained no exp or items. Coupled with its bland ancillary cast of nothing but Toads made for a horrible surprise to anyone expecting a true Paper Mario sequel.